Sometimes I try things that take me way, way, way out of my comfort zone. 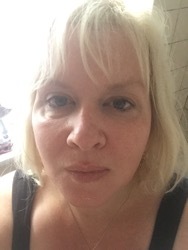 The BritMums project with Juvederm, under the hashtag #ThisIsMe did just that. Ever since I’d had a bout of Bells Palsy a few years ago, I felt extremely self-conscious. 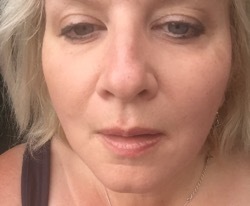 I was fortunate in that my symptoms subsided after a few months, but could still tell in the side affected (left side of face) when I was over-tired or feeling stressed. Whilst the tell-tale eye droop and wrinkle-free half forehead had disappeared (damn, I wore a side parting for the first time to show off that smooth forehead! 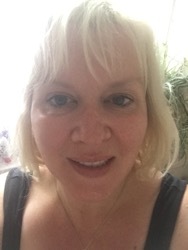 ), I knew that my face wasn’t now symmetrical – the optician would comment that my left eye was slightly lower (thanks for the confidence boost, mate!) and my one side of my lips was lower. Couple that with the fact that I hated having my photograph taken because I was also conscious of my smile, I was one agitated bunny! So, to send off a make-up selfie to BritMums, taken in the natural light took some doing, I can tell you. I sent it in and cringed at the thought of someone looking at me, analysing my features and no doubt thinking “yep, she could use a bit of a boost”. Above is half of that picture, of the side affected by Bells Palsy. Tired, drab and a bit worn-out by life. I’m not confident enough to share the whole picture. Anyway, off I went and I decided to get myself sorted smile-wise. I went to a private dentist and undertook bouts of surgery in March and April, with pretty darn good results. As with anything, the recovery was tough, plenty of ulcers (including one that would burst blood), zero appetite and zero energy and lots of sleepless nights, but it was all worth it. In the meantime, I found out that I’d been picked to attend a consultation with Juvederm and complementary treatment if I choose to accept it. However I had the small matter of healing from my cosmetic dentistry first, something I felt a bit guilty about because I didn’t get to my consultation until just before the school’s broke up and I didn’t want to waste anyone’s time. I’d had a few chats with my dentist (who also performs anti-ageing treatments at his surgery) about what he saw as potential confidence-boosting and enhancing treatments for me (that in itself is an indication of my increased sense of wellbeing) so I had a basic idea of how fillers worked and where they could be needed. I headed off to The Glass House for my consultation. My first impressions were of a calm atmosphere, muted but relaxing decor and plenty to look at on the table. Alison Telfer came out to introduce herself and I felt immediately at ease, this was something for me, to help me, not the children, just me. 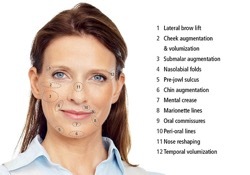 Just concentrating on my lower face, Alison suggested fillers to augment my cheeks (2 above), chin augmentation (6), and my marionette (8) and nasolabial folds (4). 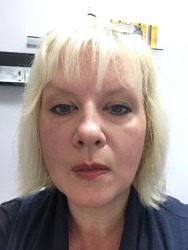 I was under no obligation to undertake the treatment but having read up on Juvederm, talked to other professionals and seen before and after pictures prior to my visit, I was very happy and comfortable to continue. Alison was very professional, she kept me at my ease throughout, showing me the levels of hygiene of the needles and solutions prior to use and telling me what she was doing as she went along. It didn’t take long and didn’t really hurt that much. I was given after-care instructions and advised that I may experience some tenderness and bruising as I had a good blood flow to my face (so that’s why I blush so easily!). I was told that I could call with any problems, anytime and we agreed, that as the school holidays were looming, I’d head back in September for a follow-up consultation. As predicted, I did have some bruising, my cheeks were particularly affected but this was soon rectified with concealer. I also found it difficult sleeping on my side for a few nights, as my cheeks (facial!) were so tender. But, it has been so worth it! I feel refreshed. The difference it has made to my inner confidence is amazing. I feel and lot brighter. It’s not a “omg, what has she done?” kind of look, more of a look that I’ve maybe had a few good nights sleep. It’s subtle and should last for about a year. Alison did mention that she’d do some work on my lip augmentation at my next visit and I’m looking forward to receiving her advice on that. I don’t mind sharing them, I love the difference that the filler in my cheeks has made and that my nose-to-mouth creases have decreased. I’m still me, just a fresher version. Disclosure: I received a consultation and complementary treatment as part of this review. My views and words are my own.